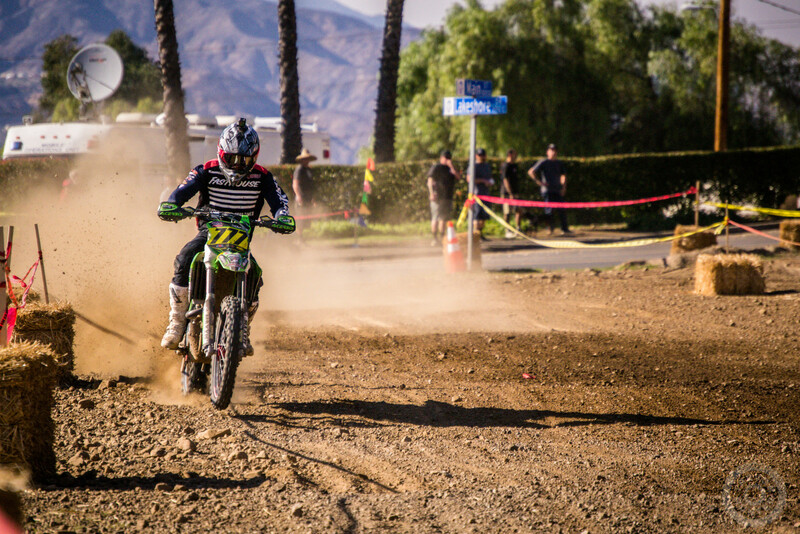 November 13th, 2018 – The Lake Elsinore Grand Prix is a unique stop on the schedule for Chaparral Motorsports, Precision Concepts, Kawasaki Team Green. The race is held in downtown Lake Elsinore, CA, utilizing the town’s Main Street for the start and finish area. Additionally, the event has a bit of a “wild west” feel about it with many entrants running some uncommon bikes and outfits. The main event over the weekend is Saturday afternoon’s Harvey Mushman 100-miler. Adding to it, the promoters created a separate forty-five-minute Pro exhibition race, which saw motocrossers Josh Grant and Derek Drake come out to compete. In the Pro race, Blayne Thompson finished third place, just ahead of his teammate Justin Seeds. Justin got off to a dead-last place start in the race and recovered to fourth by the checkers. In the Harvey Mushman event, the two were joined by Clay Hengeveld, along with nearly a hundred other entrants. Justin started right up front, running second all race long and finishing less than ten seconds behind the top spot. Likewise, Blayne Thompson started toward the front of the field and held third for the entire event. Clay’s race, on the other hand, got off to a challenging start. In the first turn, Hengeveld grabbed too much front brake and fell to the asphalt. 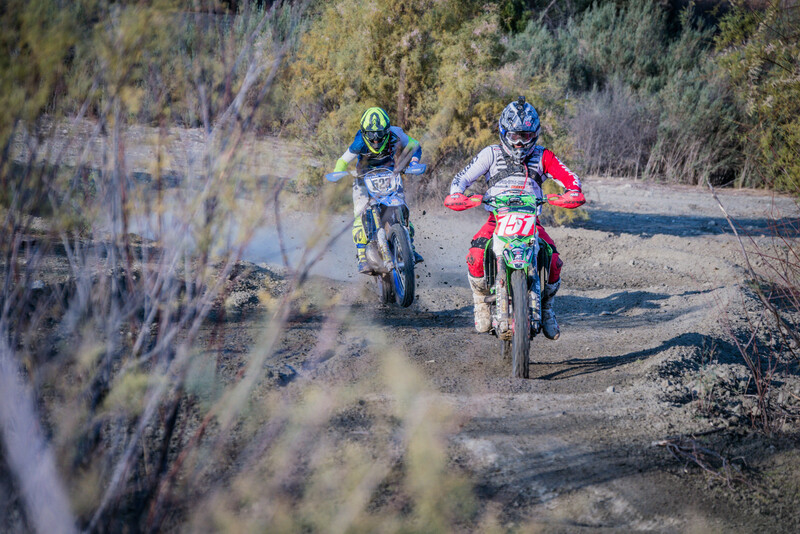 He recovered very well, passing countless riders and finishing fifth place. In the pro exhibition race, Justin didn’t read the starting procedure quite right and unfortunately stalled his bike on the line. After restarting, Seeds was quick to move through the field, reaching fourth place on the first lap. From there, he closed in on his teammate, but was unable to make a move for position and crossed the line fourth. For the Harvey Mushman main event, Justin got off to a much better start, grabbing the holeshot. However, Justin spun his tire on the asphalt through the first corner, losing momentum and the lead. The team green rider was never too far from the top spot all race long and crossed the line in second place. “Honestly, I wasn’t ready for it [the start of the pro exhibition]. Then they through the flag and I accidentally kicked it in gear and stalled. So I came off [the line] dead last. I was able to make a lot of moves there at the beginning and made my way into fourth. Then I challenged Blayne for third and made one last little effort to get him right before the ridge. When that didn’t work I focused on recovering for the Mushman. Blayne got off to a good start in the pro exhibition in third. He ran there for the entire race, claiming the final spot on the podium. Later, in the Mushman, Blayne’s race unfolded much the same way. After avoiding his teammate Clay’s downed bike in the first corner, Thompson locked down third place. By mid-race, Blayne found himself in a lonely position, with a gap ahead of and behind him. He rode smooth and smart and finished the Mushman in third. “The silt section down below was really fun, but on the ridge I just didn’t feel super confident with the rocks and the dust. I backed out of it a little there and I think that’s where I was getting pulled. In the 450 pro race, it went pretty good. We had the suspension a little softer for that one and I felt better on the ridge, so I stayed a little closer to [the leaders]. It was fun. I knew we had the Mushman [just after] so I didn’t push really hard. With the Mushman being shorter [than planned] I probably could have pushed a little harder. But it was good. 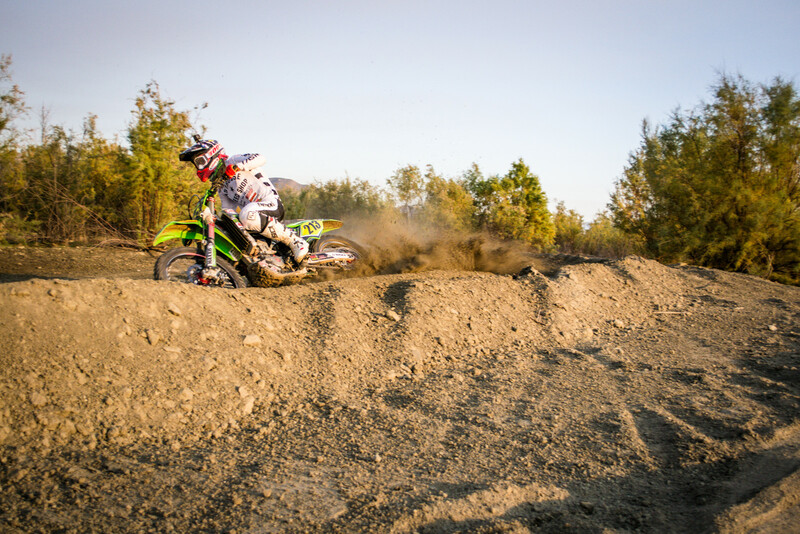 In Clay’s first time racing the Elsinore Grand Prix, he got off to a bit of a rough start. Entering the first corner, he grabbed too much front brake and hit the ground. Clay picked himself up in the fifties and went to work passing his way through the field. By the end of the first lap, Hengeveld had already worked up to ninth place. Then, over the next few laps, the team green rider worked up inside the top-five. Clay held a steady, solid pace to the finish line and crossed the checkers in fifth. “The Elsinore Grand Prix is definitely a unique one. We like hitting it because of the nostalgia. It’s really cool that they can still race down part of Main Street and keep the heritage and some of the original feel of the event. On the whole, it was a good day for us. It’s always dusty up on the ridge, so the start is pretty critical. To that end, Blayne started and finished third in the forty-five minute pro race. Justin had a bit of an issue off the start in that race, but recovered really well to get up to fourth and push his teammate to the checkers. For more information on the event, visit elsinoregrandprix.com.